This will be a review of the hair growth supplement Hairomega 3-in-1. The company claims this supplement will provide the customer with stronger, thicker, and fuller hair. Not only does this supplement contain natural ingredients, it also contains essential vitamins and minerals. Please continue to read to learn more about the product’s ingredients, and to find out whether we think this is the optimal product for your needs. This supplement is stated to be completely vegetarian, which makes it an option for those looking for a non-gelatin capsule hair supplement. The manufacturer also states that all the ingredients follow the standard set by the FDA. The actual product is manufactured out of a Good Manufacturing Practices (GMP) facility that has been inspected by the FDA. Allergy Warning – This supplement contains soy and should not be consumed by those with soy allergies. The recommended dosage for this supplement is four tablets daily, with a meal. The manufacturer claims that this supplement is tolerable for the majority of its consumers. However, there have been cases where people have suffered from indigestion or heart burn due to the saw palmetto. The manufacturer suggests those with heartburn to take the supplement with a meal. This product is retailed at $29.95 but is currently on sale for $19.91. While it is considered an affordable supplement, there are 120 tablets per bottle. The recommended daily serving is 4 tablets, making one bottle a 30-day supply. Currently the manufacturer does not offer a subscription or automatic renewal once the order runs out. The manufacturer does offer a money back guarantee. If the consumer is unsatisfied with the product, they can return it within 60 days of the purchase date to get a full refund. They also link to their reviews which have been generally very positive over the past year. Hairomega 3-in-1 is reasonably priced for a 30-day supply and also offers discounts as well. The manufacturer makes sure to include a list of all its ingredients, which is helpful and beneficial for consumers. Those who are vegetarian or prefer to stay away from gelatin-based supplements can be able to take this product into consideration for purchasing. There are generally very positive reviews about the items and with the money back guarantee, consumers can feel at ease about trying the product. If you are looking for a vegetarian-friendly, natural ingredient hair supplement, this may be a contender for you. 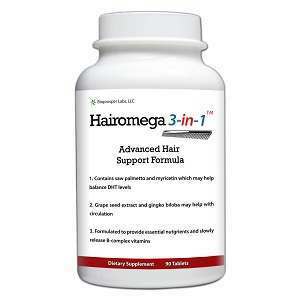 John Brownstone	reviewed Hairomega 3-in-1	on July 28th	 and gave it a rating of 3.5.